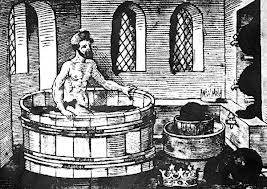 The story goes that Archimedes was in the bath when he shouted Eureka (I have found (it)). He realised that the volume of water he displaced getting in to the bath must be equal to the volume of the part of his body that was submerged. So, after long reflection, he had discovered a way that the volume of irregular objects could be measured with precision. I have read that he was so delighted that he got out of the bath and rushed through the streets of Syracuse naked. Most people recognise the phenomenon of a sudden flash of insight, the solution to a problem that you may have spent days, weeks, months or even years puzzling over. Daniel Goleman’s book The Brain and Emotional Intelligence: New Insights is beginning to reveal what goes on in that Aha mome nt. Here is Goleman in his own words. Brain studies on creativity reveal what goes on at that “Aha!” moment when we get a sudden insight. If you measure EEG brain waves during a creative moment, it turns out there is very high gamma activity that spikes 300 milliseconds before the answer comes to us. Gamma activity indicates the binding together of neurons, as far-flung brain cells connect in a new neural network – as when a new association emerges. Immediately after that gamma spike, the new idea enters our consciousness. This heightened activity focuses on the temporal area, a center on the side of the right neocortex. This is the same brain area that interprets metaphor and “gets” jokes. It understands the language of the unconscious what Freud called the “primary process”: the language of poems, of art, of myth. It’s the logic of dreams where anything goes and the impossible is possible. That high gamma spike signals that the brain has a new insight. At that moment, right hemisphere cells are using these longer branches and connections to other parts of the brain. They’ve collected more information and put it together in a novel organization. What’s the best way to mobilize this brain ability? It’s first to concentrate intently on the goal or problem, and then relax into stage three: let go. The converse of letting go – trying to force an insight – can inadvertently stifle creative breakthrough. If you’re thinking and thinking about it, you may just be getting tenser and not coming up with fresh ways of seeing things, let alone a truly creative insight. So to get to the next stage, you just let go. Unlike the intense focus of grappling with a problem head-on, the third stage is characterized by a high alpha rhythm, which signals mental relaxation, a state of openness, of daydreaming and drifting, where we’re more receptive to new ideas. This sets the stage for the novel connections that occur during the gamma spike. Those moments of out-of-the-blue, spontaneous creative insights may seem to come out of nowhere. But we can assume that the same process has gone on, where there was some degree of engagement in a creative problem, and then during “down time” neural circuits make novel associations and connections. Even when creative insights seem to arise on their own, the brain may be going through the same moves as during the three classical stages. On the other hand, I would guess that the three or four classical stages of creativity are somewhat of a useful fiction – the creative spirit is more freewheeling than that. I think the main neural action is between intense focus on the problem and then relaxing about it. And when that creative idea arrives, it’s almost certain that the brain has gone through that same heightened pitch of gamma activity that was found in the lab. Is there a way to create the conditions whereby the gamma spike is more likely to occur? Gamma spikes normally come at random – they can’t be forced. But the mental stage can be set. The pre-work for the gamma spike includes defining the problem, then immersing yourself in it. And then you let it all go – and it’s during the let-go period that gamma spike is most likely to arise, along with that “Aha!” moment, the light bulb over the head of a cartoon figure. Creative ideas are like a fragile bud – they’ve got to be nurtured so they can blossom. As a swimmer I have for a long time counselled friends and family, and myself, to take their problems to the water. I have said before that swimming helps with all troubles. I had no real explanation for this but perhaps science is now beginning to show that if you can induce a state of mindful meditation, you can free your brain to do its own work, undisturbed by conscious, controlling thoughts. I also believe that being submerged in water adds something extra. I think it was more than a happy accident that Archimdedes was in the bath when he made his discovery. This entry was posted in mindfulness, swimming science. Bookmark the permalink.